The streets of Singapore, is the origin of this wonderful breed of cat. Its proud name, Singapura, is the Malaysian word for Singapore and it is a combination of both the ticked-coated pattern and the dark brown coloured breeds of South East Asia. Today the careful development of the breed has lead to small numbers of diversified pedigreed cats, but one that is widely desired and accepted. They can also be found in most countries of the world. Sometimes described by its owner as a "pushy cat", it is an extrovert, it is curious, and it is very playful, but it will not destroy things - well not on purpose anyway. It is an intelligent and interactive cat with people and so makes a wonderful companion through "thick and thin". 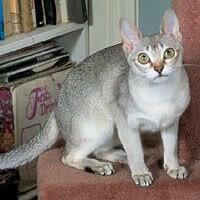 The Singapura is a small, shorthaired cat with noticeably large hazel, green or yellow eyes. The coat colouring is quite unique and looks similar to cougars. The tail is normal length, the feet are very small, the body is smaller, of a medium length and is quite muscular. If you are after a trustworthy cat this beautiful animal with its knack for play, intelligence, and unique appearance will captivate you from the moment you set eyes on it.